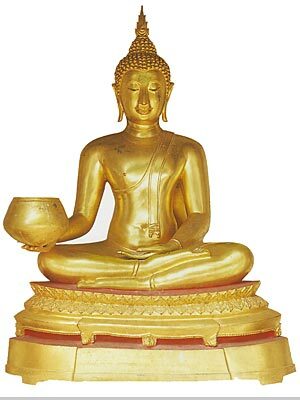 The Buddha was on the way to Kapilavastu when he fell ill. He asked Ananda to get some water from the river. The water was muddy because many carts had crossed the river. However, when the water was scooped from the river, it was clear. On the Buddha's order, on his last day of live, Ananda went into town to spread the word that the Buddha was going to pass away the same day. Subhadda (Supata), a wanderer adhering to another relgion, came to visit the Buddha, and asked him some questions. The Buddha taught him that there was no way of attaining enlightenment outside of Buddhism. Subhadda became filled with faith, and though normally there was a 'probation' period before followers of other religions could become a monk, an exception was made, and Subhadda became the last direct disciple of the Buddha on that day. Afterwards the Buddha preached his last sermon to the disciples present.